The next charity fundraising idea..discuss? Earlier this week I managed to finally get down to that there London with Mrs H, one to attend a gig by the fabulous Fleet Foxes at the Hammersmith Apollo and two, to have a bit of a mad dash around some of the capitals buzzing craft beer scene’s finest. We managed to get around only a few in the end, these were The Rake, The Market Porter, Euston Tap and Cask Pub & Kitchen. Time was tight and we only had time for one or two drinks in each establishment and in truth I’d recommend every single one, but in particular one stood out for me on the day, this was CASK Pub and Kitchen in Pimlico. 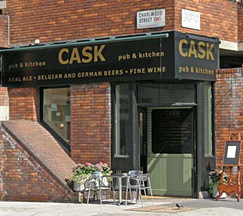 From the outside CASK has the most unassuming look about it. The smallish entrance is situated at the base of a block of flats or apartments and gives almost nothing away with it’s subtle branding as to the delights that await you within. Inside the room opens out to a bright airy space, a large wooden floored seating area is home to a sea of simple dining tables and chairs, set in wooden panelled walls painted in pastel shades. The bar sits at the back of the room and is where the real action is, it’s a beer drinkers paradise selling beers from all around the world. There are a selection of around 10 cask beers available at any one time, with a similar array of keg on the bar, this supplemented by the huge variety of bottled beers that are yours to drink in or take away. I could quite happily sit there all day and slowly make my way through the karaoke song sheet style beer menu, with the guidance of the helpful and well informed bar staff. CASK also hold regular meet the brewer events, there were around six on their notice board when we visited, keep checking the website for details of upcoming events. 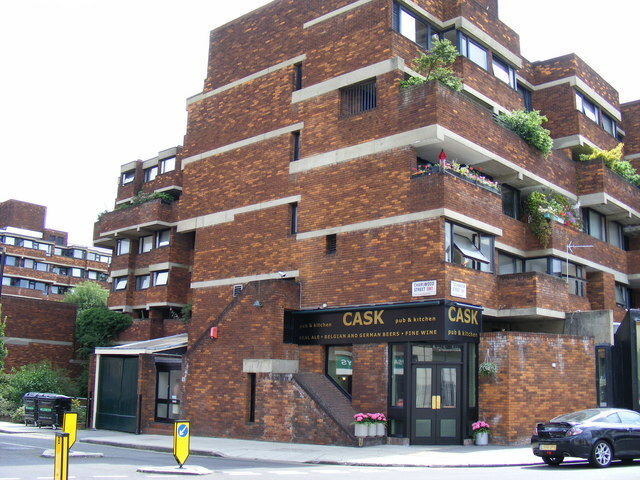 They are located at 6 Charlwood Street, Pimlico, SW1V 2EE, closest underground station is Pimlico. Please take the time to pay them a visit I promise you won’t regret it..
I’d like to give a special heads up and thanks to 6TownsMart for his great blogpost on all of these pubs and more, we printed off his notes and used them as a handy guide of where to visit. 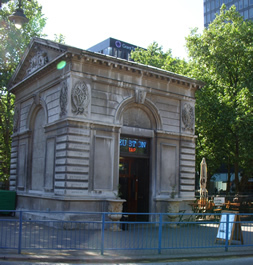 Finally a mention to our starting and finishing venue Euston Tap, located at 190 Euston Road NW1 2EF (right outside Euston Station). They have a great beer selection to drink or take away, I did both of course and came away with a rather impressive looking Italian beer Baladin Elixir.